Welcome back.........great to see you here again. Today I have a Fabulicious Design Team creation to share. For this layout I have used the newly released Elegant Chic Collection from Fabscraps. I have never been so happy to use a range.........soooooooo very beautiful. In the coming weeks you will see a lot of my layouts made from this most gorgeous collection. I have titled this layout "One Fine Day". I have used a black and white photo of my youngest from a few years back when she was only a toddler enjoying a day at one of her siblings sports days. If you keep scrolling I have included close-ups and a materials list followed by instructions on how to complete this. The Elegant Chic collection for Fabscraps is totally beautiful. The journal book is a must have piece of the collection for me. It has so many co-ordinating bits and pieces to adorn your layouts. For this layout I have used the Fence / Gate and cut in two removing the actual Gate. From the patterned papers I have made my own tags by cutting a rectangle and trimming the corners, punching a hole at the top and adhering a ring. Threaded through a little jute and tied and bow. I have also cut the title from a scalloped shape and cut it in three and tucked the other two pieces in and around the photo. For this layout I have used so many differing flowers. These grey flowers here are from Petaloo but I have also used some Kaisercraft and Green Tara flat flowers along with a few older Prima flowers sitting around in my stash. You can see here the crackle on the chipboard Treillis with the white seeping through. I added some strands of cheesecloth to soften the layout a little. And also here you can see the transparency flourish down the bottom and top of page. Be sure if you are making these that you cut the images with only a little border left around it. Otherwise it is very noticeable. Well that's all today from me. 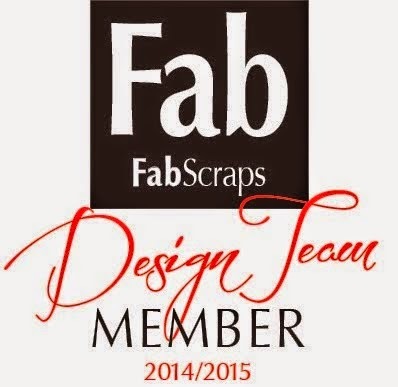 Stay tuned for more upcoming creations starring the "Elegant Chic"collection from Fabscraps. Hope you enjoyed being here today and I hope to see you back here again. 1. Take Shabby Flowers and Punch out sections randomly on three sides as seen in layout. Then cut off three sides that you have punched at 2.5 cm strips. Distress each strip and square piece from centre. Distress chocolate cardstock and adhere pieces of Shabby Flowers atop of cardstock. 2. Randomly stamp using Distress Ink (Walnut Stain) and Archival Ink (Jet Black). 3. Take White Lace and cut three large sized tags measuring 14.5cm x 7.5cm. Ensure that you use the differing patterns on White Lace. I have used the plain pink with the lace on top, the chevron and the grey floral piece. Distress and ink with Walnut Stain Distress ink or similar. Adhere to page as shown and then tie a little white jute to two of the three tags. 4.Take one Oval Frame and give it two coats of white gesso. Once dried completely emboss using Jamara embossing folder. Trim the edges of Oval Frame and gently ink a little Pumice Stone Distress Ink and Walnut Stain Distress Ink over raised areas of embossing and frame edge. Adhere photo behind oval frame and then mat onto a piece of distressed grey cardstock measuring 12.5 x 16.8cms. Adhere atop of the tags ensuring it is central to layout. 5. Cut a die piece from Sizzix Treillis using some old cardstock or chipboard. Give it a medium coat of Distress Crackle Paint - Brushed Pewter. Leave to dry. Once dry spritz with Dylusions (White Linen) ink spray. Wipe away excess with baby wipe and rip into a few pieces. Adhere around your page as shown. 6. From your Fabscraps Journal Book take out the large Fence. Cut out the gate from the centre and adhere each other fence side either side of your photo. 7.From your Fabscraps journal book cut the "One Fine Day" tag very carefully. Cut into three sections and distress and if desired ink edges. Arrange and adhere around the photo as shown. Also cut the banner titled "Extra Special Times". Distress and ink this and pop it at the right top in a torn area of your layout. Arrange a little bit of white cheesecloth behind this. 8. Make transparency flourishes using embossing powder as previously noted in instructions for "Little One" see blog post. Once set fussy cut your flourishes. I made two flourishes and cut them down smaller and arranged around clusters as shown in layout. 9. You can now start to embellish your layout with flowers, Birdhouse resin, handmade flourishes and cheesecloth. 10. Your layout is now ready to frame and hang! !